At the request of Best Doctors physicians, we offer customized recognition items for any physician who has ever been selected as a Best Doctor. These recognition items make a handsome addition to any lobby, waiting room or home office. The wall plaque features the Best Doctors logo and the appropriate inclusion years on a polished brass plate mounted on beautifully crafted, hand-finished, solid cherry wood. Those Best Doctors who have been selected for multiple years may be interested in the First Year Inclusion plaque which displays both the first year the physician was selected and the current listing years. In addition to the traditional wall plaque, we also offer a desktop commemorative. Made of curved, clear acrylic, and custom-etched with the Best Doctors logo and inclusion dates, this item is a modern and tasteful way to showcase your selection. The light-catching gold accented and flat base makes it easy to display on any flat surface such as a desk or counter. Please click here for complete details on all recognition items, including photos, pricing and order information. Discounts are available on multiple orders. Please allow eight weeks for delivery. View a printable version of the 2017-2018 plaque order form. PLEASE NOTE: Physicians who wish to order a plaque for a previous poll year, please call 617-963-1167 for assistance. 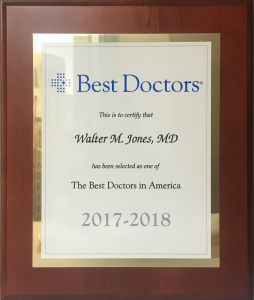 The official Best Doctors in America® wall plaque and desktop recognition items are available exclusively from Best Doctors, Inc. Best Doctors, Inc. does not authorize, contract with or license any organization to sell recognition items for Best Doctors, Inc. 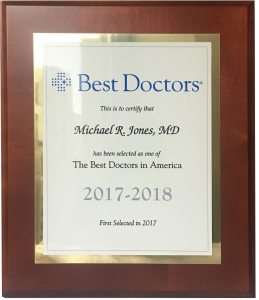 Please contact us at plaques@bestdoctors.com or 617-963-1167 to confirm the legitimacy of a solicitation regarding recognition items or with any questions. Best Doctors, Inc. never sells your contact information to outside vendors. 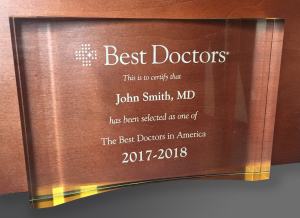 The Standard Plaque features the doctor’s name, in the format requested – John Sample, MD or Dr. John Sample – along with the current year of inclusion: 2017-2018. The First Year Inclusion Plaque shows the doctor’s name, in the format requested – John Sample, MD or Dr. John Sample – along with the current year of inclusion: 2017-2018. In addition, the plaque shows the first year the doctor was selected as a Best Doctor. The Desktop Commemorative shows the doctor’s name, in the format requested – John Sample, MD or Dr. John Sample – along with the current years of inclusion: 2017-2018. As our plaques are personalized items, Best Doctors® will not be responsible for orders of duplicate plaques. Please check your most recent plaque purchase to make sure you are not ordering a duplicate, before placing your order.